My travels this week have taken me up, through the smog, to seek out Robert Nichols (no relation to the ‘great’ Mark! ), who’s a leading light behind superior Middlesborough website fly me to the moon – (http://www.fmttmboro.com). Wasting little time for introductions and other such niceties, I asked him for his thoughts ahead of this weekends game. Well, we a couple of weeks on and we are still smarting from that shocking FA Cup exit to Cardiff. You will know the feeling. But we played so appallingly in a game that could have put right all this season’s woes. 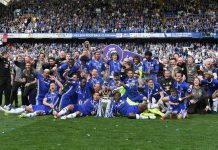 A Wembley FA Cup semi final with the prospect of a final and real opportunity to win the FA Cup for the first time would certainly have more than made up for a very disappointing season otherwise. Not to be. Back to the realities of the relegation fight. lthough fortunately that has since eased greatly. We can’t score goals. That was the biggest single issue going into this season how were we going to replace Viduka who took the pay cheque to travel up the road to Newcastle and then when Yakubu also moved on we were left with largely untried and untested forwards. We’ve since bought Mido and Alves but both will probably be more effective next season when they are fully (match) fit. Other than that we need to sort out a long term plan for the engine room of the side. We have not really replaced Boateng but the Boat has really come back to form in recent games. But can he do it again next term? I think we will need to reinforce this central midfield area. Do you now feel confident that you’ve done enough to stay up? If not, where do you see the extra points coming from? Yes I think we are almost there. One more win at home against Bolton perhaps should seal it. But with recent draws v Arsenal and Villa away we will be looking to get something from our games with you and Man U. We have a habit of raising our game against the toughest opponents and not turning up against the minnows. We finish with 2 successive home games – so if we still need the points this could be telling. What do you think of Chelsea, as if we needed to ask? In particular, has our support been “spoiled” by recent successes? Well, I don’t think you would swap places would you? It must be weird after years in the wilderness then Bates comes along and you become a contender. Then Roman’s revolution takes you to the very top of the tree. I wouldn’t mind sampling that. Gareth Southgate’s always seemed like a nice guy – has he got the ‘steel’ that a successful manager needs? How is he performing now compared to his first weeks in the job? That’s the big question everyone asks. We can’t really know the answer except he doesn’t shirk any big decisions. His first decision was not to offer Hasselbaink another contract. He has stripped Boateng of his captaincy midseason because he felt it was detrimental to both him and the team. So, Gareth makes the kind of moves that imply there is steel behind that nice man façade. Who’s been your stand out performer this year? David Wheater – rewarded with a callup to the England squad last week. He has been commanding at centre back and scored a few vital goals as well. A down to earth local lad who could be a future Boro captain. He only came into the team because of injuries to Woodgate and Pogatetz. Wheaters form meant we could afford to sell Woodgate – something that would have been astonishing last season. That says it all. Stewart Downing – gets knocked to high heaven by everyone yet gets his head down crosses the ball, passes the ball and scores goals. Is a quality player getting better and better. Wheater is tremendous as well and we all like Mad Dog Pogatetz the new skipper – the kind of player who would run through walls for you. As for George Boateng – well he is indestructible. You might hear us singing that on Sunday. 12th position. Not good enough really but a platform to kick on from we hope. 2nd although you could now push Man United all the way. It could be very tight indeed. We’ve still not forgiven you for ’89 (though ’97 went a long way to exorcising those ghosts!) – what are your memories of those games? The play offs were phenomenal. Difficult to compare that tension. The atmosphere at and around Stamford Bridge was the most hostile I have ever experienced – well, until we went to Roma. When those gates swung open at the Shed End at the final whistle we really thought the whole ground was going to attack us. Was an awful moment. But a great event for us – in coming back from liquidation and 3rd division to the top flight in 2 seasons. You bounced back too. The three cup final defeats were pretty sickening. Blue is obviously not our colour. That’s for certain. And finally – Give us a score prediction. I’m going for 1-1 – we will raise our game again and it could catch you out expecting an easy win. Am looking forward to it although not catching the bus at 5.30am. Hope I remember to put my clock forward! Well thanks for that Robert, if we spot someone sneaking in an hour into the game, we’ll know that your alarm didn’t go off! Good luck for the rest of the season and particularly the game v Man U.